Giampiero Massolo has been President of ISPI since January 2017. He has also been President of Fincantieri Spa since May 2016. 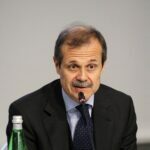 In May 2012 he was appointed Coordinator of the Italian Intelligence Community. Between 2008 and 2009 he served as the Prime Minister’s personal representative (sherpa) for the G8 and G20 Summits, and in 2007-2012 he was the Secretary General of the Ministry of Foreign Affairs. Between 2004 and 2006 he was, successively, at the Foreign Affairs Ministry (MFA), Director General for Multilateral Political Affairs and Human Rights, Head of the Cabinet of the Minister and Director General for Personnel. From 2001 until 2003 he served as Deputy Secretary General. He was Spokesman for the MFA between 1996 and 2001, and served in 1994-1996 as the Principal Private Secretary to the Prime Minister.